B&S have established an excellent reputation in the Asian market. 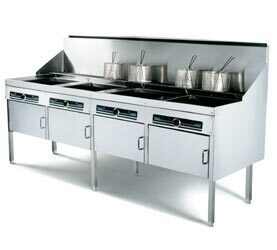 With over 15 configurations available, we have yet to come across a kitchen we couldn't cater for. The B&S story started with manufacturing fast food fryers over 50 years ago. With the industry growing and technology advancing B&S continues to offer competitive fast food kitchen products. Next time you need a fast food fryer make sure you consider B&S. Whilst B&S have over 35 standard units in their product range, some kitchens are unique and require specific products to be made to meet expectations. B&S ability to manufacture custom, made-to-order products is one of their strengths. From designing and building four hole woks with built in sauce holders to building steamers with wok cookers, B&S agility, knowledge and expertise means there is no kitchen they can't find a solution for.